In the opening days of the testing sequence, observers at the east Texas test and launch facility documented numerous cryogenic tests of Starhopper’s propellant tanks that hold Liquid Oxygen (LOX) and Liquid Methane to fuel the vehicle’s Raptor engines. 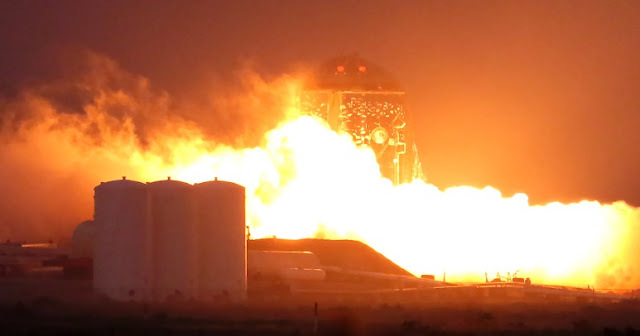 This was followed by visual confirmation of the first Raptor engine’s arrival at the Texas site and subsequent installation to Starhopper. In quick order, residents of Boca Chica Village were notified via mail of imminent tests and road closures that would occur as early as the week of 18 March. This indicated that no guests will be allowed past the security checkpoint during the flight test operations of Starhopper. Elon Musk confirmed via Twitter that it would “hopefully” be a hop – but only a barely getting off the ground hop and not a low-altitude suborbital hop. But Mr. Musk noted on Twitter that the company is no longer building a nose cone for Starhopper – that they “don’t need it” – and that the additional construction seen at Boca Chica of late is actually for the first orbital Starship vehicle. During a period of over a week, StarHopper underwent almost daily tanking tests, WDRs and a few pre-burner tests. Some of these tests worked to mitigate an issue with ice formations on the prevalves, as noted by Elon Musk a few days ago. Then, on Thursday, came the milestone of the first Raptor firing on the Hopper. The firing appeared to last a few seconds and was classed as “green” per an Elon Musk tweet shortly after the firing. Mr. Musk described it as the first hop, although that wasn’t noticeable on video acquired by NSF’s BocaChicaGal, a local resident who has been taking a series of photos and videos of SpaceX’s Boca Chica site for this site. That was not unexpected, given the Hopper is tethered and would have only hopped a few inches on this initial test. Once the tethers are removed, Hopper will hop several feet and then at incrementally larger altitudes. A second firing took place on Friday night. This time Hopper did actually hop to the maximum allowance of her tethers, which will have been about three feet in height. The SN3 Raptor is already undergoing testing at SpaceX’s test site in McGregor, Texas – as spotted from the air by NSF’s Gary Blair. Meanwhile, as Starhopper continued toward its inaugural test at Boca Chica, Elon Musk spent some time answering questions on how the design of Starship continues to evolve, albeit not as drastically as it has before – a good signal that the design iteration phase is coming to completion as build operations begin.